We will be closed the whole of the Easter weekend. That’s: Friday 19th, Saturday 20th, Sunday 21st and Monday 22nd April. Back open Tuesday 23rd April. Our new mentaiko dishes proved so popular, they have become part of the main menu! MENTAIKO CREAM RAMEN and MENTAIKO CREAM MAZEMEN!! I lived in Osaka for a bit in the 90s and fell in love with Japan and especially the food culture. I really loved these tiny ramen shops where they focused on only one or two dishes served up in backstreet, hustle bustle spots. Many years of corporate life later, on a slow Friday afternoon in the office, a touch hungover from Thursday night drinking, someone asked me the standard, ‘what would you do if you won the lottery’ question. I quickly realised that after a year or two of traveling and ‘consumption’ I’d start asking serious questions about what I really want to do in life. The ramen light bulb came on again and within a month I’d quit my job and was on a plane to Japan. Then it dawned on me; I hadn’t actually won the lottery.. doh! Anyway I travelled up and down Japan for a few months eating A LOT of ramen, trying to remember the language and studying in a ramen school. I even bought a noodle machine in a rush of blood to the head moment. 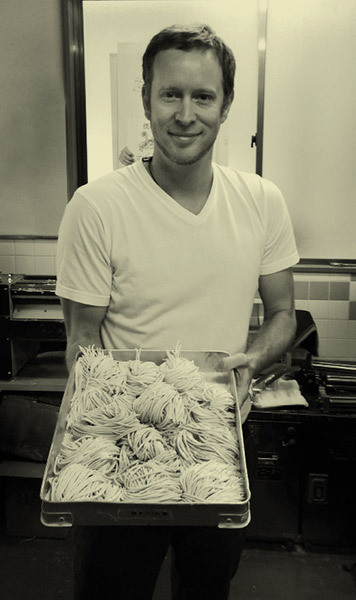 Back in London I spent the next 6 months making ramen in my kitchen every single day. My wife would bring Japanese colleagues home from the office on Fridays and they’d test that week’s batch and give me pointers. 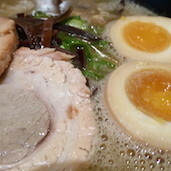 Then I worked in Ippudo making ramen for 6 months. In the summer of 2015 I launched Monohon Ramen as a pop up and over the course of the next year we sold a couple thousand bowls of ramen wherever we could find a space in east London. Then one day, a nice man told me there was a restaurant for rent in Old Street and I had some more of those, ‘are you really going to do this?’ moments. A few months and an emptied savings account later, I had the keys. Now we’ve cleaned up the place and I have hired some nice people to help me cook and serve my ramen. We’re making everything in house; the soup, the noodles, the toppings. We’re starting slow and focusing on a small number of dishes. Hopefully 1 or 2 people will come in and check us out! Our total focus is authenticity. It’s a labour of love. Here’s a tiny glimpse of what goes into a bowl. We don’t buy mass-produced, long-life noodles. 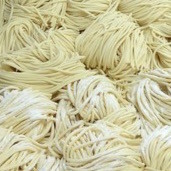 Everyday we make fresh noodles in-house. The recipe is simple but much thought about. We use specialist flour from Japan (since most flour in Britain is for bread and not suitable) kansui, salt and water. Since London water is far too hard, we use softer spring water to get the right final texture. 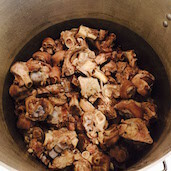 Our soup is made from pork bones with kelp and shiitake mushrooms added for natural umami. It’s boiled furiously for a whole day so that the fat emulsifies into the soup giving the creamy texture and whiteish colour. We constantly monitor the soup viscosity with a refractometer (honest!) to get the right final thickness. Our shouyu dare (seasoning sauce), for example, is made from 10 different ingredients and we measure salinity (using a different refractometer this time) to make sure the saltiness is the same in every bowl. Our chashu (pork belly) topping is slow-braised for up to 5 hours in sake, soy sauce and sugar until it’s exceptionally tender. Our hanjuku-tamago (soft boiled eggs) are cooked for precisely 6 minutes and 10 seconds and then marinated for 2 days! We are always looking for hardworking and talented people. Please send us your CV if you are interested to join our team. We will close for the Easter break: Friday 19th – Monday 22nd April 2019. MONOHON — a slang term in Japanese meaning, ‘the real thing’. Copyright 2016 - 2018 Monohon Ramen. All rights reserved.